For the Department of Angiography and Intervention cardiology of MC Erebouni fibroid embolization, chemoembolization of malignant neoplasms and a liver hemangioma has become an integral part of the work of interventional cardiologists. For the first time in Armenia was performed the unique surgery – prostatic artery embolization and benign prostatic hyperplasia (prostate adenoma) by interventional cardiologist Dr. A. Tzaturyan and urologist of Department of Urology Dr. S. Abovyan, who have recently passed advanced training and returned from Portugal armed with new knowledge. Until recently the most commonly used treatment of the patients with prostate adenoma was the surgical method - transurethral resection of the prostate. In recent years in leading clinics of the world has been increasingly used the new method of treatment of prostate adenoma - prostatic artery embolization. It is a minimally invasive intervention, which allows to stop the blood flow to the prostate adenoma, therefore occurs the opposite development and size normalization. In comparison with the surgical treatment, prostatic artery embolization allows to avoid the anesthetic risk, bleeding risk, big operative traumas, a large number of contraindications and postoperative complications, and also violation of the reproductive function and impotence. A patient A.S.,1938 y/b, was admitted to Urology Department of MC Erebouni in 01.07.2016 with complaints of extremely difficult urination and feeling of incomplete emptying of bladder. After carrying out clinical and laboratory examinations, it was diagnosed: benign prostatic hyperplasia. It was decided to carry out surgery. In 07.07.2016 under local anesthesia, in angiographic laboratory was carried out surgery - prostatic artery embolization by interventional cardiologist of Department of Angiography and Interventional Cardiology Dr. A. Tzaturyan. Tiny catheter was introduced in the femoral artery in groin area, through which was inserted the special catheter to iliac artery for catheterization of prostatic artery. Further, through the microcatheter to prostatic arteries were inserted particles for embolization (then catheters were removed). After completion the procedure of embolization, the patient was transferred to the ward and discharged the next day. A patient A.G., 1959 y/b., was admitted to MC Erebouni in 26.07.2016 with complaints to the presence of urinary catheter, which has been set (over 25-30 days ago and periodically was replaced) due to acute urinary retention. Subsequently, when changing the catheter ability of independent urination wasn`t restored. After carrying out clinical and laboratory examinations it was diagnosed: benign prostatic hyperplasia. Chronic urinary retention. In 27.07.2016, it was also carried out transcatheter arterial embolization of the prostatic arteries, as described above. After the procedure the patient was discharged the next day. It should be noted, that after such kind of surgical intervention the patients are discharged from hospital on the same day. The effectiveness of such procedure is registered just in a few hours. The operation allows to reduce prostate size up to 50% (which is an excellent indicator!). Urodynamic indices, in particular uroflowmetry index, is within the normal range. A unique endovascular intervention - prostate artery embolization with very effective result was carried out for the first time in Armenia in MC Erebouni. The key to success are the professionalism, high skills of urologists and endovascular surgeons, who had pass specialization and training at the most experienced doctor in the world Dr. Joao Martins Pisco,MD, PHD. 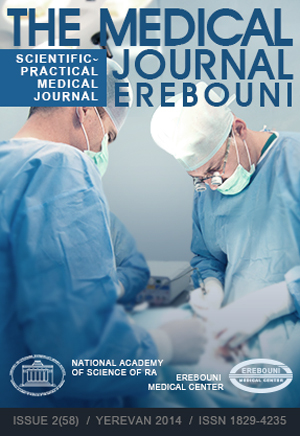 Such operations undoubtedly will be included in routine practice of MC Erebouni and become an integral part of the professional approach of the surgeons in Armenia.